"It's great! Enjoy the recipe!" Season the snapper fillets with sea salt and pepper. Place two grape leaves on a clean surface so that they overlap slightly. Place a fillet in the center. Fold the leaves over the center of the fillet to enclose completely. Brush with oil on the top and bottom to keep the leaves from sticking, and place on a broiler pan. Repeat with the remaining fillets and leaves. Place the fish under the preheated broiler about 6 inches from the heat source. Broil for 4 minutes per side, turning once, or until fish is opaque. While the fish is broiling, melt the butter in a small saucepan over medium heat. Stir in the garlic, lemon zest, capers, sherry and parsley. Season with salt and pepper. To serve, remove the fish packets to a platter, and spoon the sauce over the top. See how to make a quick and delicious Mexican Gulf Coast seafood recipe. Great dish! 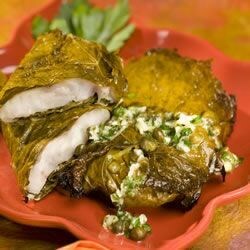 I didn't have time to find grape leaves, so I used cabbage leaves...it was divine!! Next time I'll try it w/ grape leaves! Eat well, live well ~ Peace! I like the fish, but the sauce was extremely intense, I dilluted it with water. This goes great with the healthy garden salad; also a finalist. Nice, very nice. Simple in preparation and taste. Was looking for a way to use the rest of some jarred grape leaves and found this recipe - made it exactly as stated and it was delicious! You know it's good when the 6 year old loves the little "berries" (capers) and the 11 year old gobbles it up. Truly an easy, restaurant quality dish.